DUNMORE’s Multi-Layer Insulation (MLI) films and tapes help solve the mission critical challenge of maintaining operational temperature while the European Space Agency's Rosetta spacecraft has traveled through deep space for over a decade. Rosetta's Philae lander is scheduled to land on a comet 317 million miles from earth tomorrow, November 12, 2014. From the time of its launch on March 2, 2004 - and continuing through its mission for the last ten years - DUNMORE Corporation's insulating products have protected the European Space Agency's Rosetta space probe, its sensitive instruments and the highly unique Philae lander from the harsh environment of space. The Philae lander is set to land on a comet about 317 million miles (507 million kilometers) from earth tomorrow, November 12, 2014. Between 2005 and 2009 the Rosetta spacecraft was maneuvered into space by three gravity assists or fly-bys, two from Earth and one from Mars. It entered the asteroid belt twice in the process. In 2011 it was put into deep space hibernation, then was awakened in January of this year as it began making adjustments for its rendezvous with Comet 67P/Churyumov-Gerasimenko. DUNMORE's role in the mission revolved around its multi-layer insulation (MLI) films (http://www.dunmore.com/products/multi-layer-films.html) and polyimide tapes (http://www.dunmore.com/products/polyimide-tape.html). 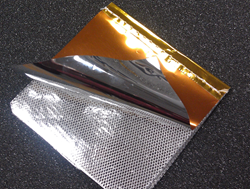 The DuPont™ Kapton® polyimide based films are layered together with protective separation films to create blankets ranging from 10 to 30 layers thick, depending upon the type and level of protection required at each location on the spacecraft. The films are stacked together, cut into complex shapes to cover each component of the spacecraft, then sewn together and secured with polyimide tapes. The resulting MLI blankets both absorb and reflect radiant energy and provide protection against impact from micrometeoroids. Rosetta has traveled more than 4 billion miles (6.5 billion kilometers) since launch. While the spacecraft flew in hibernation mode for nearly three years, it rotated on its axis about once each minute, constantly exposing each surface of the spacecraft to alternating heat from the sun and to frigid cold; temperatures variations at the surface of the craft spanned a range of 300°C. It passed through the asteroid belt in hibernation mode, risking micrometeoroid damage. In spite of the harsh environment of space, Rosetta is currently in orbit around Comet Churyumov-Gerasimenko and is expected to launch its Philae lander on November 12, marking the first time a man-made object will attempt to land on a comet. About DUNMORE - DUNMORE Corporation is a global supplier of engineered coated and laminated films and foils. DUNMORE offers film conversion services such as coating, metalizing and laminating along with contract film manufacturing (http://www.dunmore.com/services/contract-manufacturing.html). DUNMORE produces coated film, metalized film and laminating film substrates for the photovoltaic, graphic arts, packaging, aerospace, insulation, surfacing and fashion industries. DUNMORE is privately held, ISO 9001:2008 and OSHA VPP Star certified. For complete information on DUNMORE's products, services and industries served, please visit DUNMORE's website http://www.dunmore.com.